Below is a guest post from Brad Patterson of Kwaga, a fan of our Gmail Meter tool and productivity advocate. I love email. There, I said it. I’m Brad, a recovering email junkie. As a community manager I get a fair amount of email and have to handle them quickly to keep our wonderful customers at Evercontact happy. I used to sit in my inbox all day to make sure I got back to clients as soon as possible, and that is indeed great customer service. But is “replying as fast as possible” really that valuable to your business? No. Most people are happy with a response in < 24 hours, and anything faster is nice, but not a “must-have” by any means. Think of it as a play on standard deviations of availability in supply chain management. For most professionals, email is only one of your to-dos and you certainly have more important projects and more creative things that your organization needs to do every day. Yet if you’re trying to doing them while sitting in the inbox, your productivity will suffer. That’s why it’s time to try something else. With a bit of visualization (thanks to Gmail Meter), here are the 5 most important changes that rekindled my relationship with this amazing lil’ tool called email, and got me to inbox zero every day. This might be the biggest productivity change you can make. 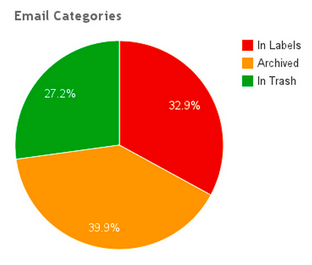 When I surveyed our power-users, over 50% checked their email more than 25 times/day. Choose 3-5 times during the day when you’ll PROCESS (not check) your email and then close your inbox or pause it with Boomerang’s inbox pause. As you can see below, I process emails mostly around noon after tackling my other more demanding/creative tasks, though I do skim-process emails both earlier in the day and right when I get to work to make sure nothing needs immediate attention. 4) Delete it. Yes… enjoy it, and it do it with a shortcut (# in gmail). Archive it (shorcut “e” in gmail) if it’s an exchange with colleagues/clients or purely informational and you think there might be value at a later time. Imagine opening your inbox in the morning and seeing 40 unread emails instead of 90. That’s the magic of filters, and why nearly 100% of my emails below are labeled, archived or deleted (and very rarely in the inbox because I automate a lot and process the rest quickly). For any email that’s not ‘important’, set up filters to auto-skip the inbox or delete. Better yet, do this with Unroll.me or Sanebox which will automatically separate unimportant emails from your inbox like newsletters, marketing emails, and social media notifications. Bonus: these services also help easily unsubscribe from unwanted emails, so use them regularly! Email gets a bad reputation but it is a great tool for simple communication. That said, it is not a great tool for dynamic, complex, detailed, time/progress-oriented collaborations. 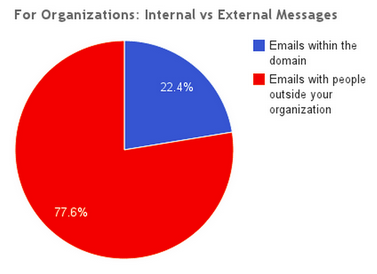 This is why you should try use email as an OUTBOUND tool and make the best of other applications for INTERNAL communications and project management. Check out Yammer, Trello/Asana, Skype/Gchat, and good ol’ face-to-face instead. Sharing preliminary thoughts in a Google Doc is a great way to optimize face-to-face. Once you’ve adopted some of these others tools, avoid CC/BCC and instead share informational-oriented topics on a social enterprise platform like Yammer. Note that it’s not easy to break other teammates’ habits, which is why I’m having trouble getting my internal email below 10%. 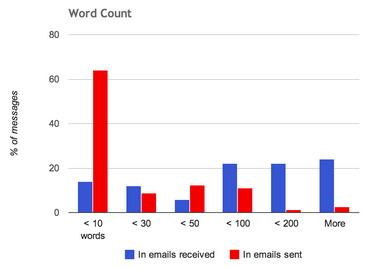 Write shorter emails and you’ll get shorter responses. Try to limit messages to 5 sentences, and if you have to go beyond that try to organize information in bullet points / numbers so your recipient can process your email in a timely manner! I was blown away by Fred Wilson’s email use. He clearly has a load that is 5x+ my own, and I’m pretty sure the only way he gets through it is by processing quickly and keeping his emails very short (ie over 50% of emails are < 10 words, like my own below). Don’t change anything this week, but try out Gmail Meter to see how you’re using email and also download RescueTime (an activity monitoring tool) to see how you’re spending time on your computer as a whole. Choose 5 times to check email each day this week and once done, close your inbox and be productive elsewhere. Make a conscious effort to write shorter emails and see if your team would be interested in trying out more collaborative tools for internal communication. 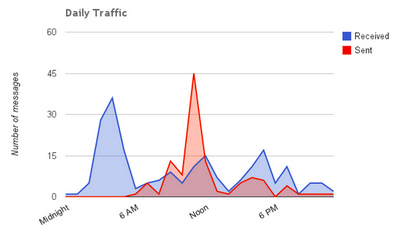 Also note if at the end of this week if your inbox time has decreased via RescueTime stats. Drop a comment below to share another email hack we should know about!